U.S. President Donald Trump and first lady Melania Trump depart from Glasgow Prestwick Airport in Prestwick, Britain, July 15, 2018. U.S. President Donald Trump is branding Russia, China and the European Union as "foes" of the United States, but specifically is singling out long-time allies in Europe for taking advantage of the United States on trade deals. "I think we have a lot of foes," the U.S. leader told CBS News in an interview broadcast Sunday that was taped the day before at his Turnberry golf course in Scotland. 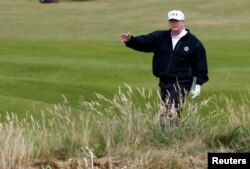 U.S. President Donald Trump gestures as he walks on the course of his golf resort, in Turnberry, Scotland, July 14, 2018. "I think the European Union is a foe, what they do to us in trade," he said. "Now, you wouldn't think of the European Union, but they're a foe. Russia is foe in certain respects. China is a foe economically, certainly they are a foe. But that doesn't mean they are bad. It doesn't mean anything. It means that they are competitive." "I respect the leaders of those countries," Trump said, referring to the European Union. "But, in a trade sense, they've really taken advantage of us and many of those countries are in NATO and they weren't paying their bills" to meet the NATO goal of each of the 29 member states of the Western military alliance spending two percent of the size of their national economies on defense. 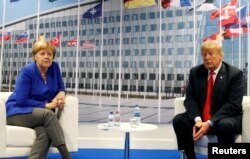 Trump criticized Germany, as he had last week before a contentious NATO summit in Brussels, for its deal with Russia to build a natural gas pipeline in the Baltic Sea that will send send fuel from Russia to Germany. "Germany made a pipeline deal with Russia," Trump said. "Where they're going to be paying Russia billions and billions of dollars a year for energy, and I say that's not good, that's not fair. You're supposed to be fighting for someone and then that someone gives billions of dollars to the one you're, you know, guarding against. I think it's ridiculous, so I let that be known also this time. I'll tell you what, there's a lot of anger at the fact that Germany is paying Russia billions of dollars. There's a lot of anger. I also think it's a very bad thing for Germany. Because it's like, what, are they waving a white flag?" German Chancellor Angela Merkel, who grew up in communist East Germany, rebuffed Trump's criticism last week, saying that she had "experienced myself how a part of Germany was controlled by the Soviet Union" and said she was glad her country today, with communist East Germany and democratic West Germany united since 1990, can set "independent policies" and make "independent decisions." Donald Tusk, president of the European Council, dismissed Trump's attack on European countries, saying, "America and the EU are best friends. Whoever says we are foes is spreading fake news," employing one of Trump's favorite pejoratives for news stories he does not like. The European Union, which last year had a $151 billion trade surplus with the United States, is engaged in a contentious dispute over import tariffs with the United States, imposing higher levies on such iconic U.S. products as bourbon, jeans and motorcycles after Trump boosted U.S. tariffs on aluminum and steel imports from Europe.